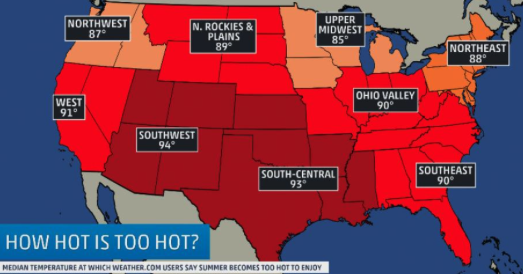 Last year, The Weather Channel’s official website, www.weather.com, reported the results of a survey that was given to our nation about what temperature they feel is too hot to enjoy. (Hawaii and Alaska were not surveyed.) Through the results, they found that the responses highly relied on where the person is from. This would make sense, considering those in the North are not as used to intense heat as we are here in the South. Arizona and Nevada tend to have the highest tolerance for heat, voting a median of 100 degrees as being “too hot to enjoy”. Texas was listed second, with 95 degrees Fahrenheit as their answer. The people of Arkansas and Utah agreed. If you’re looking for a way to make the best out of Texas’ blazing summers, come by Hidden Cove. Beat the heat by taking a dip in Lake Lewisville, or take part in a ton of other activities offered here, such as fishing, kayaking, skiing, and camping. See you soon!